Tofu is a soft protein food made from soybean liquid -- called soy milk -- that has been curdled. The resulting curd is formed into a solid, which can be sliced or pureed and added to dishes. Tofu has many proposed health benefits and can be included as part of a healthy diet, used as a meat substitute. This soybean creation is a versatile food that can be used for everything from grilling to baking. The soy tofu is made from is touted as an aid for reducing high cholesterol, preventing certain cancers, reducing the bone loss associated with osteoporosis and improving the symptoms of menopause. Tofu is also high in protein and contains all essential amino acids, referred to as the building blocks of protein. Food items that provide all essential amino acids are considered complete protein foods. The soy protein in tofu and other soy products may be responsible for curbing the risk of heart disease through the reduction of low-density lipoprotein, or bad, cholesterol. The U.S. Food and Drug Administration acknowledges that at least 25 g of soy protein per day may have beneficial heart benefits. Refer to the food label on tofu packaging to determine a serving size to meet this 25 g recommendation. Tofu also contains substances called isoflavones, in particular an isoflavone called phytoestrogen. Phytoestrogen is a plant-based compound which mimics the human hormone, estrogen. Due to this connection, soy is believed to help prevent hormone-related cancers, such as breast and endometrial cancer. The isoflavones in soy are also believed to help reverse the bone loss that causes osteoporosis and the hot flashes experienced by menopausal women. More research is needed, however, to determine the true health effects of soy on all of these conditions, notes the University of Maryland Medical Center. 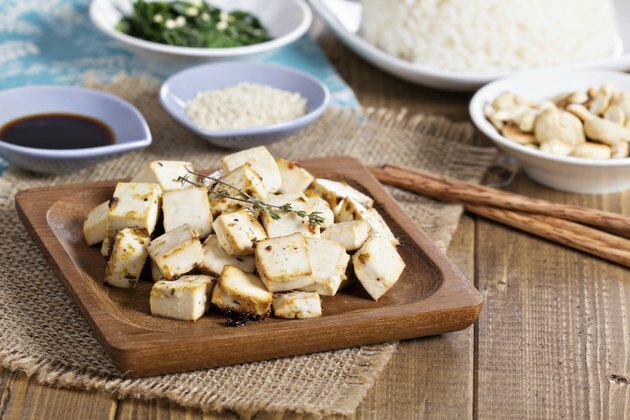 Tofu is mild in flavor and is known for taking on the flavor of whatever it is cooked with, providing texture and protein to the dishes and beverages it is added to. Tofu is available in different consistencies, either firm, soft or the smoothest variety, silken. Firm tofu can be sliced and added to stir-fry or seasoned like meat and carefully grilled as a meat substitute. Soft tofu can be pureed and used as a ricotta cheese substitute in lasagna, or mashed and added to casseroles. Silken tofu is suitable for making smoothies when blended with fruit, honey and a few ice cubes. It's also smooth enough in texture for use in dips or toppings.